Hi, guys!!! How's life? Oh, that's just me up there basking in the glorious weather of Southern California. Our trip was fantastic, in a nutshell. I did not want to come home! Shocking, I know. All good things must come to an end, I suppose. Sigh. Let's talk about this bracelet that I'm giving away, shall we? 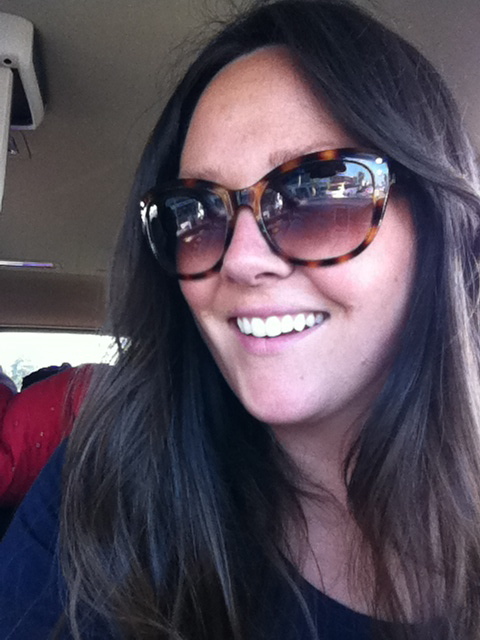 We ate lunch at Wahoo's in Newport one day and then strolled around the shops a little. We happened upon a really great mommy/baby boutique. 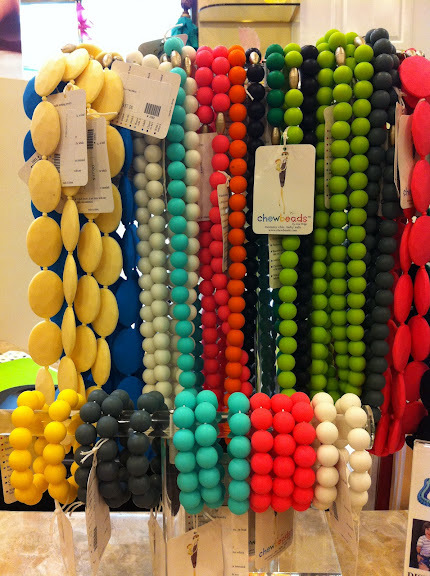 Immediately upon walking in I saw a small rack draped with bright colored beads. BEADS, glorious beads! I tried on some of the bracelets and was sold on buying one and then the sales lady gave me the shpeel and I was double sold. They are called Chewbeads and are made for fashionable moms to wear and have something to allow your teething babies to gum and chew on. Pretty smart, right? 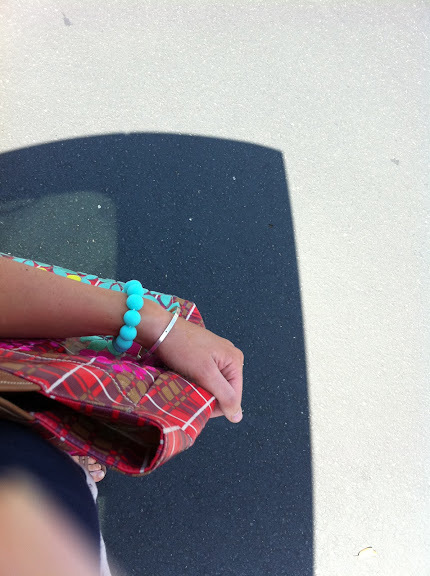 I'm giving away the aqua bracelet today-- a little token from California for ya. To enter, just LEAVE A COMMENT and I will PICK AND ANNOUNCE THE WINNER ON FRIDAY! And if you don't have a teething baby on your hip, PLEASE don't let that keep you from entering. Anyone can rock this bracelet! Also, I am still working on the popular recipes page I talked about last week. I need to get some professional help with the coding so the page can attach properly to the blog.....blah, blah, blah. Hoping to have it up and running as soon as possible! I could use one of these right now! My baby is getting his top teeth and biting everything! Bonus that they are super cute too! PS. I love your blog... everyone in our household loves your roasted chicken recipe! I love wahoos!! And those are adorable! My little buddy is teething right now so this would be perfect! He could rock a bracelet right? I have heard about these before and have been tempted to purchase one, not for me but for a baby shower gift. Oh WOW!! I have a teething baby . . . how convenient! Her first tooth just broke through last week. :) Thanks for sharing your fun find . . . I will have to see if I can find these somewhere in my neck of the woods! What a clever idea! that's a fun idea! i love turquoise! Briana I saw these Chewbeads recently they look awesome and so fun for all involved, mom and baby! What a great idea! I was just lamenting the fact I can't wear jewelry to church because my baby would eat it. Well I don't have a baby that is teething, but hey I'll chew on that little beauty. Great idea! Hope i win!!! Wait, this is genius! And this is perfect for me because 1. I have a teething baby on my hip! and 2. I LOVE aqua! and 3. I am a Cali girl and love me some Cali lovin'. and 4. I am going to need that lil' gem on my hellish plane ride to Utah this summer! Ooh, I hope I win! Lance would love something new to chew on! P.S. I love the look of those beads - more matte than most beads tend to be. Super cute. yay! i saw these on martha stewart about a year ago and fell in love! i'd love to have the bracelet for my soon-to-be-teether! thanks for the giveaway! Love it! And the color is perfection. Glad you had a great trip! Adorable! What will they think of next? This is such a great idea. Turquoise is one of my favorite colors and such a cool souvenir from Cali - it makes you think of the ocean, sun and sand along with summer being right around the corner. Cute! You got me all excited for our trip to Southern Cal and Legoland this summer. Woohoo! I would love this bracelet! What a cool idea! Great idea. Love the colors. Sorry we missed you in St George but hope you had fun in Disney land. Never heard of chewbeads...but I do have a drooly, teething baby!! Awesome idea! love the bracelet! and love your blog! thanks for blogging!